The time-honored concept of spring cleaning isn't just for the living space in your house. It also extends to your basement or garage. If your home is small, getting rid of clutter and organizing your belongings to gain functional space is important in every area. As you get started, think first in terms of safety. In order to utilize the garage as a carpeted playroom for the kids, a craft room or any other extension of usable interior square footage, consider switching out a gas-run water heater, which involves a pilot light to be on at all times, for an electric tankless type. Also known as instantaneous or demand water-heaters, these units provide hot water only as is needed by heating the cold water at a rate of 2 to 5 gallons per minute. Traditional storage water heaters produce standby energy losses that cost you money, but these types can deliver between 200 gallons and 500 gallons of hot water every hour on demand. Next, make sure that you clean up rags or newspaper. Get rid of old oil or paint properly. Many communities sponsor special pickup days for the sanctioned disposal of toxic materials at this time of year. Properly seal containers of any cleaning supplies or painting products that are flammable. Store these a safe distance away from any possible source that could ignite the potentially flammable products. Now organize the remaining useful items using products from a variety of sources according to your needs. Storage goes right up the wall, in the photo shown here, on platinum-mesh and silver-metal components from elfa, available at The Container Store. Their Garage Solution works in standard spaces from 121 inches to 126 inches deep and 73 inches to 78 inches wide. The ventilated shelves defy dust and have the strength to support heavy items. The mesh drawers in the system prevent tiny objects from falling through while still allowing good visibility of the contents. You will need a minimum 8-foot ceiling and no fuse boxes, cables, ducts or other obstructions on the mounting surface area. If you have a more complex situation, the company offers custom planning at no charge. You can attach to drywall, wood or masonry with standard installation instructions, or contact the company for installation into plaster walls or other surfaces. If you're interested in creating a more functional laundry area in the garage or basement, look for accordion drying-racks and ironing-center organizers available from companies such as Iron-A-Way, which markets fold-away and built-in ironing boards. The Container Store also carries laundry-room items. Consult professional closet companies as resources for the planning and supply of storage equipment. California Closets, The Closet Factory and The Container Store can help. Once you have your storage needs under control, think about adding some color to perk up the traditionally bland walls of your basement or garage. 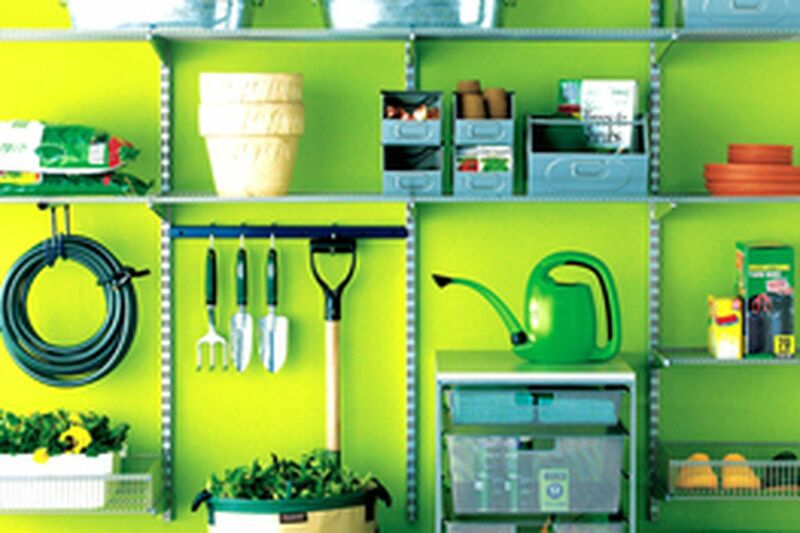 In the photo here, apple green provides a lively background for the shelving. You might also want to put down an industrial carpet with a pattern. Christine Brun, ASID, is a San Diego-based interior designer and the author of "Big Ideas for Small Spaces." Send questions and comments to her by e-mail at cbaintdes@hotmail.com.